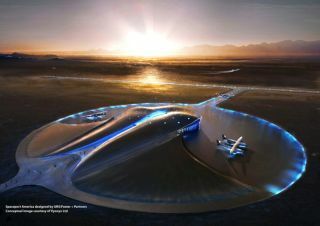 An artist's concept of Spaceport America, a suborbital spaceport under construction in New Mexico. Leaders in the burgeoning private space industry are gathering in the New Mexico desert this week for the seventh annual International Symposium for Personal and Commercial Spaceflight. Officials from commercial space firms including SpaceX, Sierra Nevada, Bigelow Aerospace, XCOR and others will join representatives from NASA and the Federal Aviation Administration (FAA) to discuss the growing field of for-profit spaceflight. The meeting will run Oct. 19 – 20 at the New Mexico Farm and Ranch Heritage Museum in Las Cruces, N.M. Many of these companies are in the process of building and test-flying spacecraft intended to carry paying passengers to suborbital and orbital space. Topics under discussion at the two-day symposium will include how to keep the United States competitive in the global space marketplace, protecting intellectual property, the challenges of lowering the cost of launching people and cargo to orbit and building relationships for international collaboration in space. The conference will wrap up with a trip to the world's first commercial spaceport, Spaceport America, which is being built near Truth or Consequences, N.M. The spaceport's modern hangar terminal was dedicated in a ceremony on Monday (Oct. 17).